This portrait from 1940 is of particular significance within the Hatton Gallery’s permanent collection because of its interesting connections to a number of other works (and because it’s a wonderful painting!). It was painted when, as a German, Schwitters faced months of ‘enemy alien’ internment on the Isle of Man, there he painted a number of fellow internees, including this portrait of Fred Uhlman (as well as being known for sculpting leftover porridge). 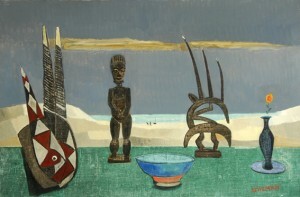 The Hatton purchased the painting directly from the sitter in 1974. 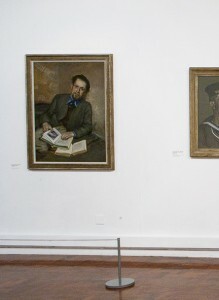 There is of course a better known and more important work by Schwitters in the Hatton collection, his permanently displayed Merzbarn wall, described by critic Andrew Graham-Dixon as ‘one of the great masterpieces of European Dadaism’ and ‘one of the most moving and singular works of art created in Britain in the twentieth century ‘. Fred Uhlman (1901-1985) too has other connections with the Hatton. A lawyer, novelist, artist and collector, shortly before his death he donated to the Gallery the 70 piece ‘Fred and Diana Uhlman collection of African Sculpture’. The Gallery also owns a painting by Uhlman, ‘Still Life with African Figures’ and a terracotta portrait bust of him by Karin Jonzen. It is likely that Uhlman was well disposed towards the Hatton due to the presence here of his friend Schwitters’ final masterpiece. Returning to the portrait, this is one of the Hatton’s most popular works and is often out on loan, over the past year it has been included in the Ben Uri Gallery’s travelling exhibition ‘Forced Journey’s’ about artists in exile in Britain between 1933-45. During this tour the painting visited two quite unusual venues, the Sayle Gallery in Douglas on the Isle of Man, to mark the 70th anniversary of the opening in May 1940 of the island’s internment camps, and also Birkenhead’s magnificent 1920s Williamson Art Gallery and Museum. Following this tour it was decided to replace the paintings 1960s frame with something that would both improve the display of the painting and afford it better protection when it next goes off on some travels. The painting and its lovely new frame can be seen at the Hatton until 19 February in ‘A Century of Portraits’. Click here to find out more about the Century of Portraits exhibition at the Hatton. Wonderful and interesting exhibition; I knew nothing about German refugees herw in WW2. Love the portrait of Fred Uhlman lighgt brushwork expression.